Sorry, Detroit, but New York’s walking culture is always on its toes. Perhaps that’s what happens, among other things, when you cram 8 million people into a space just a bit over half of Detroit’s footprint. One of these eight million is Yoonjin Lee, or Zoonzin, a student at the School of Visual Arts in Manhattan. Recently Zoonzin became what the Atlantic Cities referred to as the “unofficial curator of lost stuff” when she started a project addressing the sad plight of our most useful quotidian paraphernalia, such as the ubiquitous lost glove. 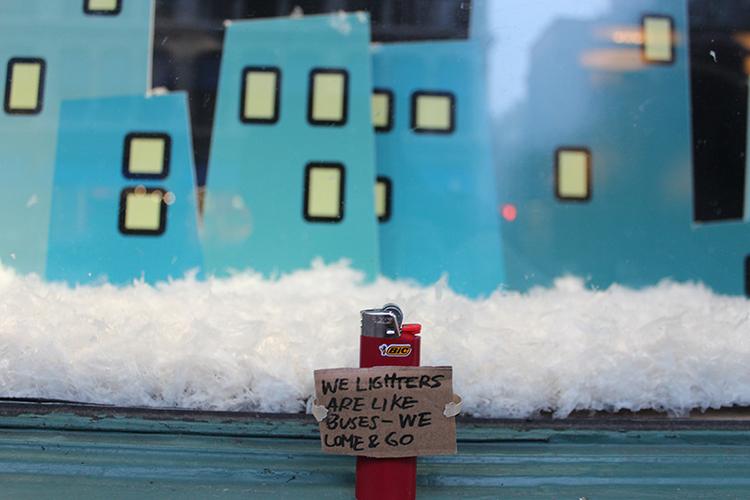 Lighters, lip balm, candy, metro cards, hair ties, and even a sunny yellow paperclip are among her other subjects. 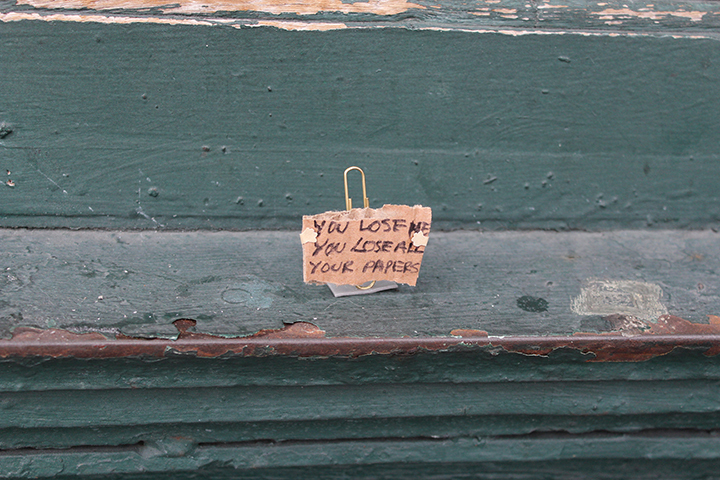 After locating a forlorn item hanging out alone in a public space, she creates a small note and affixes it to the object, leaving the tiny thing suddenly noticeable to passersby. Her messages are sometimes poignant, others, petulant, and the whole project is tremendously candid — how admirable it is that she’s not deterred by having kind of gnarly handwriting and only rough scraps of cardboard at her disposal. One can only cringe imagining how sad the lost stuff is as snow starts to fall and their weepy black magic marker voice spirals toward the dank oblivion of storm drains. Zoonzin’s kind of empathy, curiosity, and whimsy should be among the essentials we pack with us on any outing, among other more tangible trappings. It’s a wonderful world in which someone else cares enough about the possibilities, the varied life stories of these mundane little objects, to document them in such a small and transient way. It’s like craigslist missed connections, but without all the blundering “m4f hot waitress at Applebee’s” and dismal misspellings. (She does have the caps lock on pretty hard, though). Where would these things be now, if they hadn’t fatefully plummeted to the sidewalk? We’ll never know, but Zoonzin isn’t hesitating to make it up. 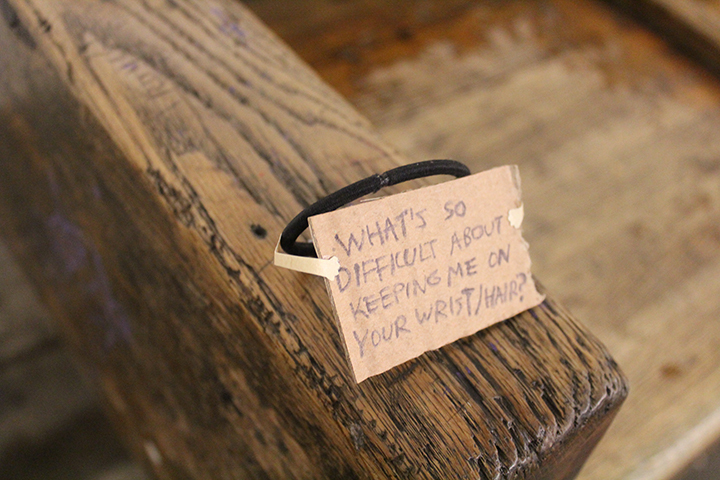 See more of her humorous assertions on the Little Lost Project website, facebook, or tumblr.